Mounds and mounds of tart, fresh, crisp organic apples, saucy with cinnamon apple cider and loaded with crunchy granola crumbs. The original pie that eats like a candy bar! 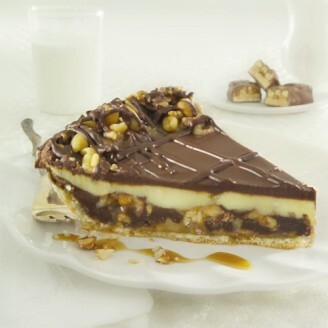 Large chunks of Snickers bars, fudgy brownie, caramel, peanuts and a tart cream cheese filling. Six layers of incredibly moist carrot cake sandwiched with smooth cream cheese icing all studded with pecans and flakes of fresh toasted coconut. scored, serves 14 — 8 lbs., 8 oz. Colossal... layer upon layer of dark moist chocolate cake, sandwiched with a silky smooth chocolate filling, piled high with chunks of cake. Unit Weight: 8 lbs. 5 oz. Golden toffee crunches float among clouds of creamy rich Kahlua chocolate mousse. A graham cracker crust is topped with a thick layer of rich chocolate fudge filling followed by creamy New York cheesecake. Finished with golden caramel and loaded with pecan pieces. Subtly spiced and generously covered with cream cheese icing, this delectable cake is filled with freshly grated carrots, sweet crushed pineapple and walnuts. Finished with a dusting of ground pistachios. This pyramid of rich chocolate cream is studded with nuts, chocolate chips and turtle cheesecake. Featuring chocolate curls and golden caramel erupting from the center. Dense, moist buttermilk cake bursting with coconut and pecans and lavished with a cream cheese frosting. An eruption of color and flavor, this unique dessert has juicy whole raspberries folded into a delicious cream cheese mixture with rivers of raspberry sauce cascading from the peak. Rich and creamy New York style cheesecake swirled with pureed fresh strawberries and a hint of lime juice, all nestled in a buttery graham cracker crust.